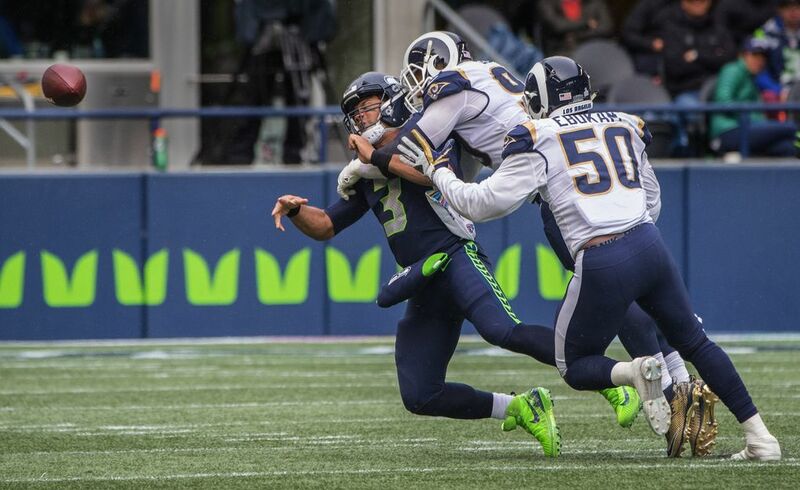 Last year, the Rams came into Seattle and dethroned the Seahawks. 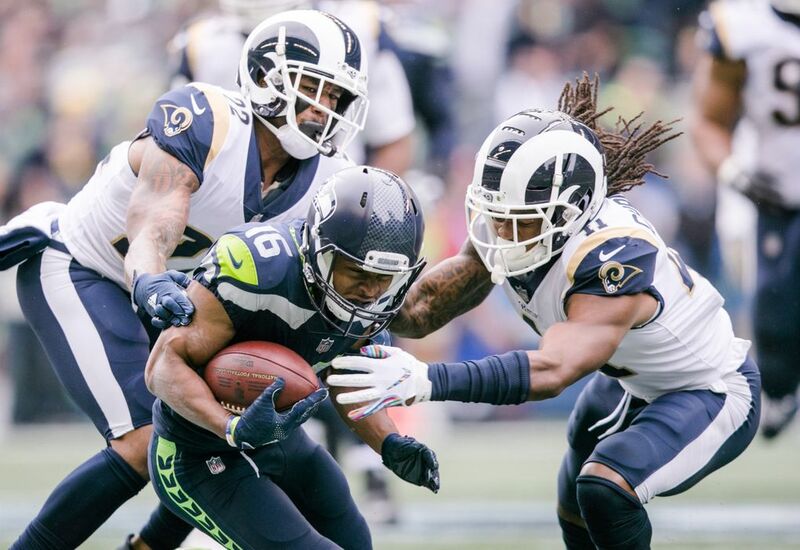 Now the Hawks are 10-point home underdogs against Jared Goff, Todd Gurley and the Rams' ferocious defense. Follow here for live updates, highlights and analysis as the Hawks look to deal Los Angeles its first loss of the season. 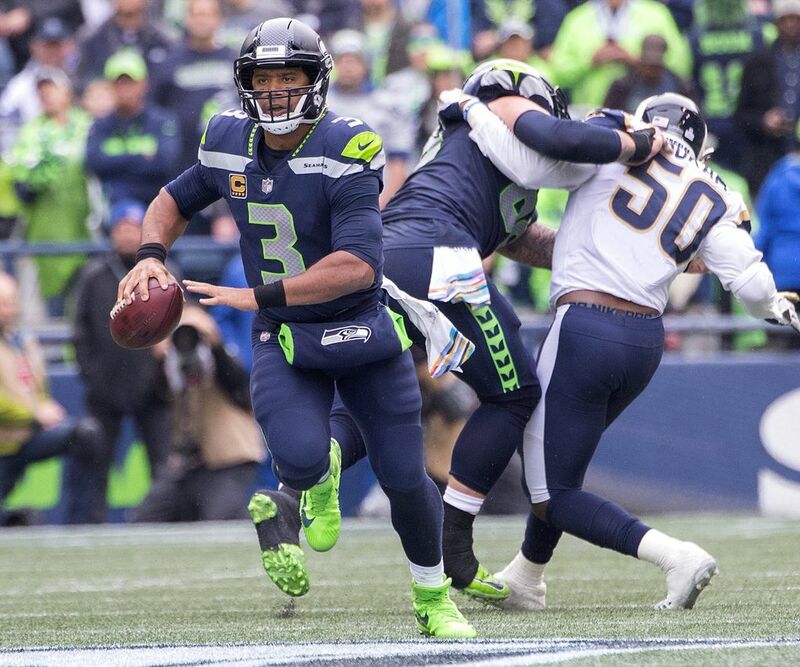 1:25 p.m. | CenturyLink Field | Seattle, Wash.
6:05 | Rams 33, Seahawks 31 Cairo Santos gets redemption and is good from 39 yards to give the Rams the lead again. 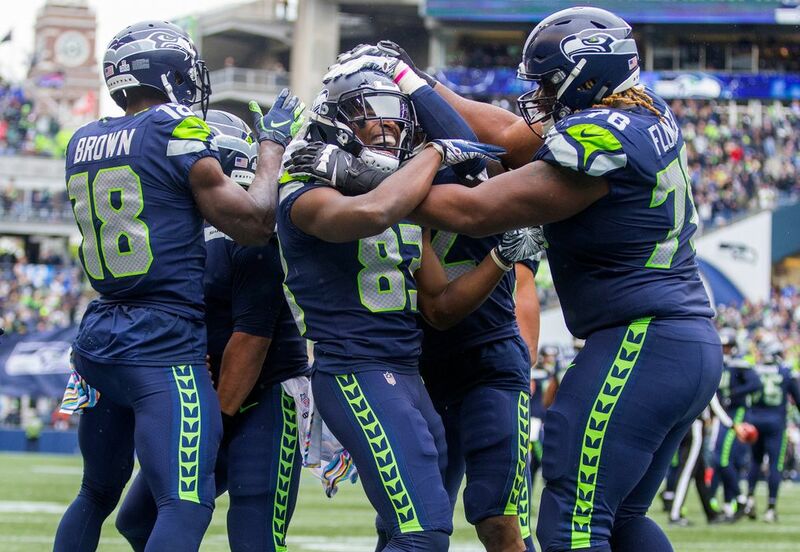 Will the Seahawks let them get the ball back? 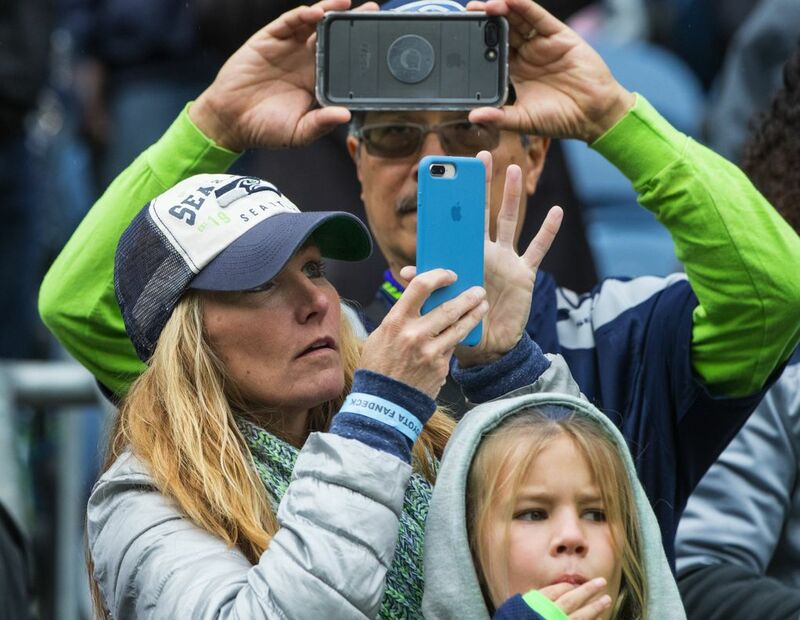 9:04 | Seahawks 31, Rams 30 CenturyLink Field is rocking like it’s 199– wait. 2014. Rockin’ like it’s 2014. 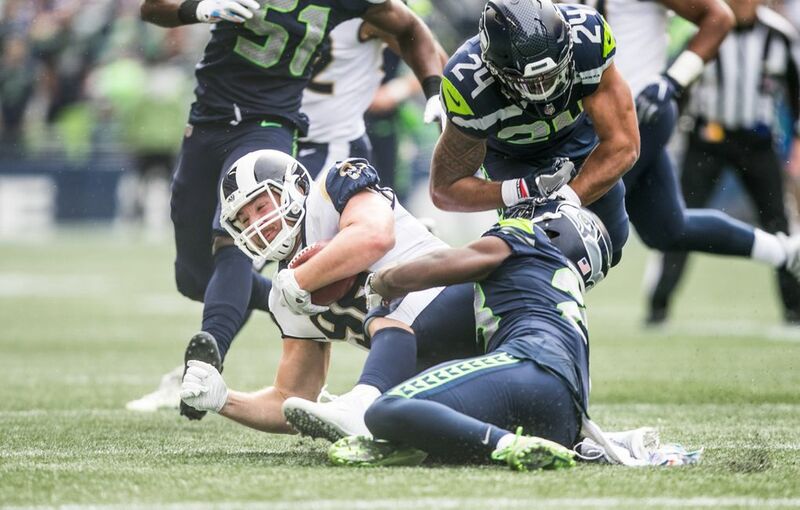 The Rams are forced to use their final timeout with still more than nine minutes left after some miscommunication between Jared Goff and the sideline. 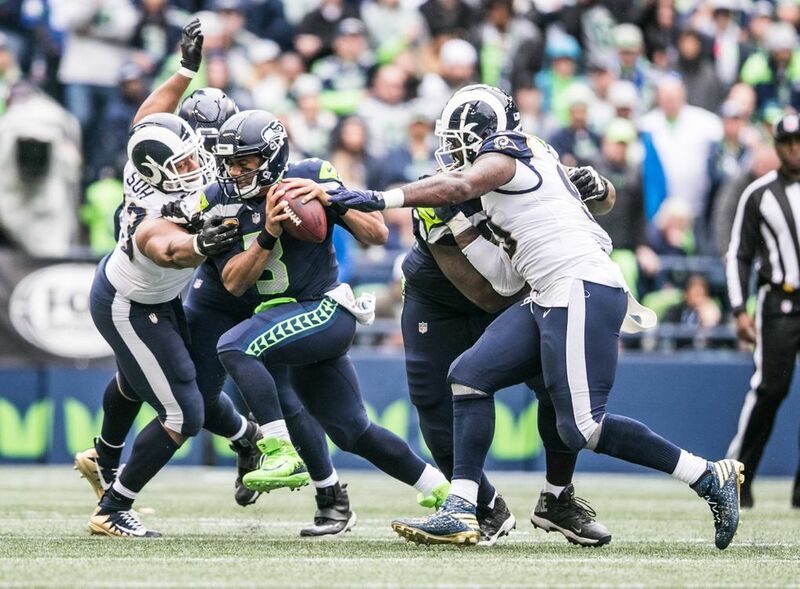 14:54 | Seahawks 31, Rams 30 On the first play of the fourth quarter, the Rams go for it on fourth-and-2 and aren’t able to convert. 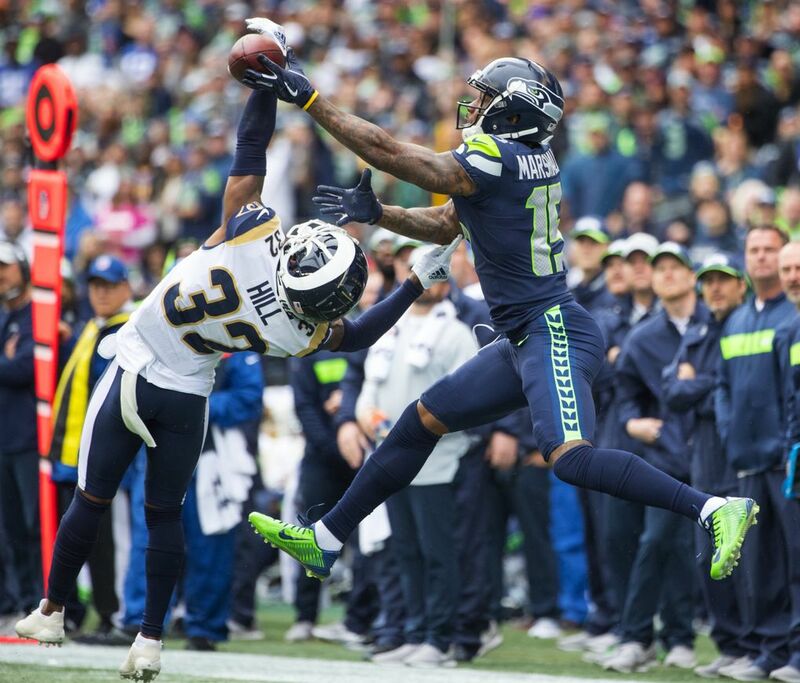 But on the pass break-up, Shaquill Griffin gets called for PI, extending the Rams’ drive and allowing Todd Gurley to get into the end zone for the third time. But, with Greg Zuerlein out with a groin injury, the Rams’ newly signed kicker, Cairo Santos, MISSES the point-after. 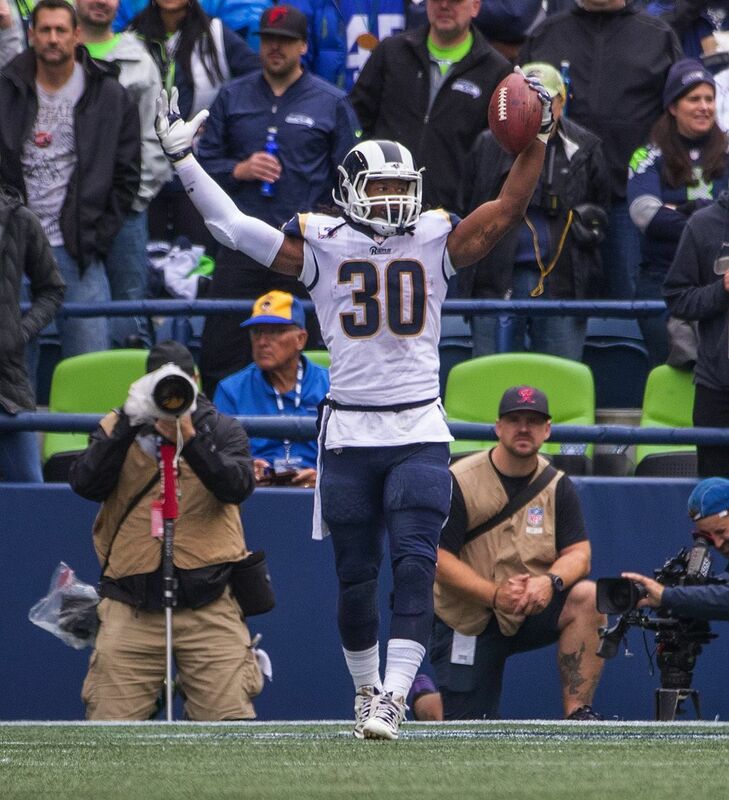 Todd Gurley (@TG3II) just scored his THIRD TD of the day! 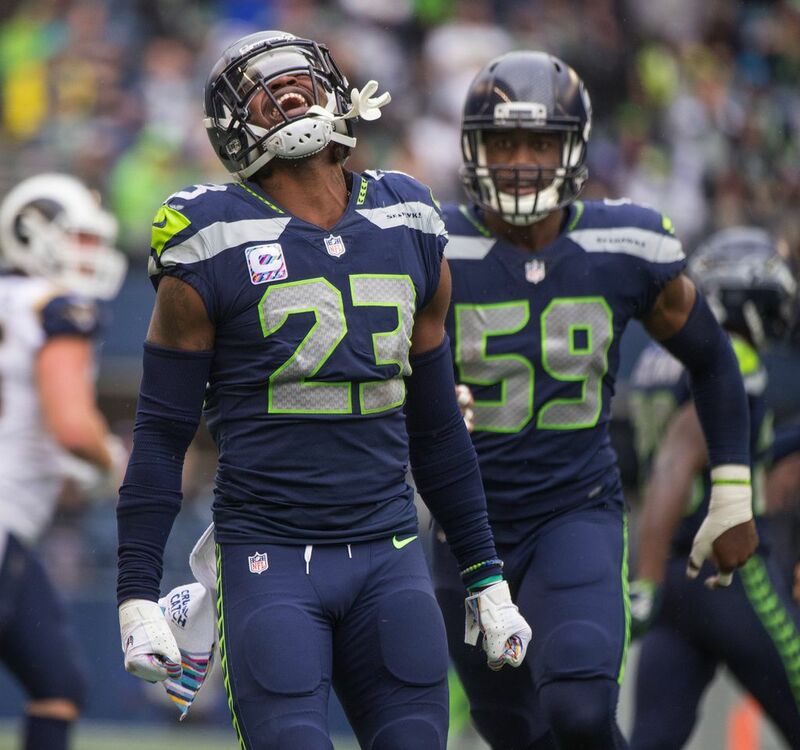 1:34 | Seahawks 31, Rams 24 David Moore gets separation from Marcus Peters and the Seahawks answer AGAIN. That’s Moore’s second TD of the day, and at least the second time Peters, the fiery former Husky, has been beat deep. David Moore does it again! 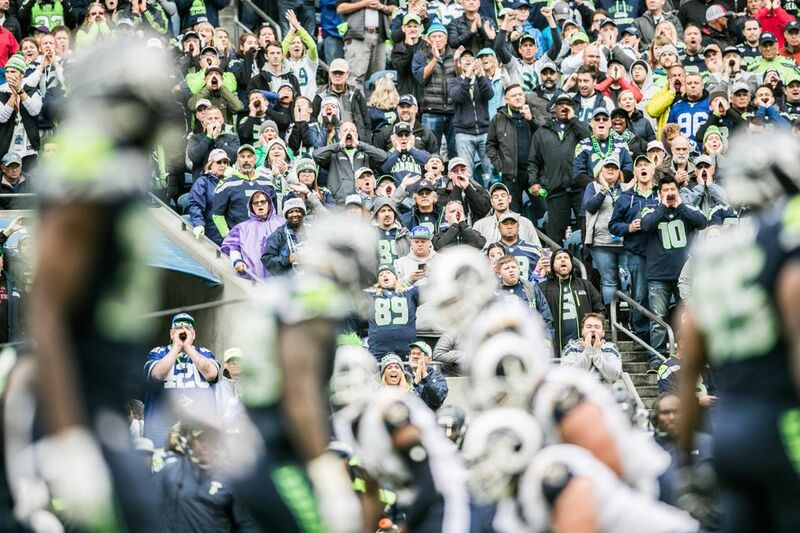 5:04 | Seahawks 24, Rams 24 Nobody can get any separation. 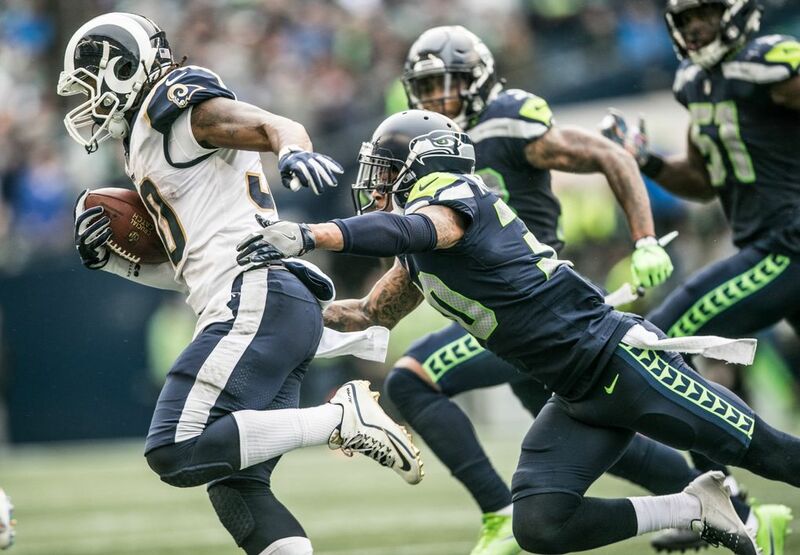 The Rams eat up another 5:30 of clock, driving 65 yards on nine plays to tie it up again.
.@TG3II finds the end zone for the 2nd time today! 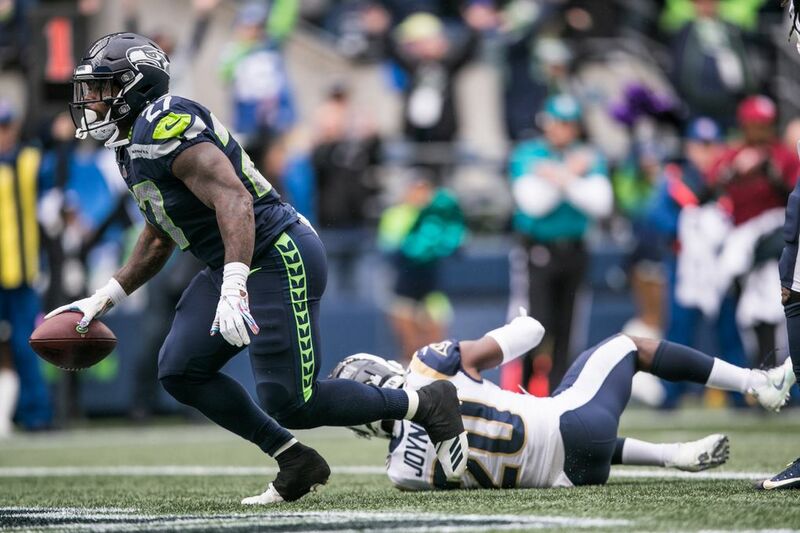 10:43 | Seahawks 24, Rams 17 Seattle takes the second-half kickoff and marches down the field to retake the lead, finished off by a nine-yard, something-out-of-nothing TD throw from Russell Wilson to David Moore. 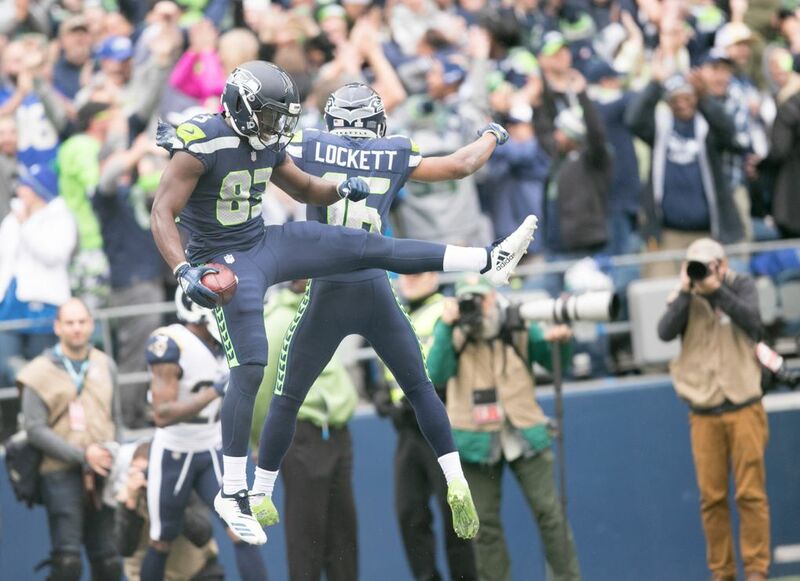 The Seahawks have to be ecstatic with 17-17 tie at halftime. 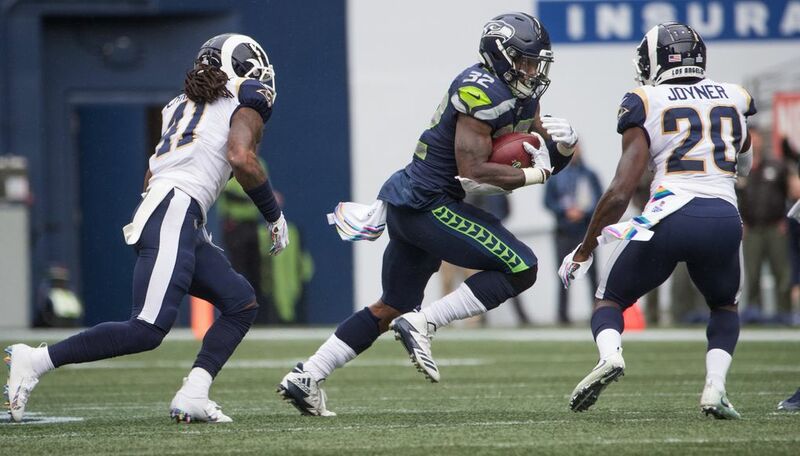 The Rams squandered a few scoring chances and Seattle grinded it out on offense, with one big-play strike from Wilson to Lockett. 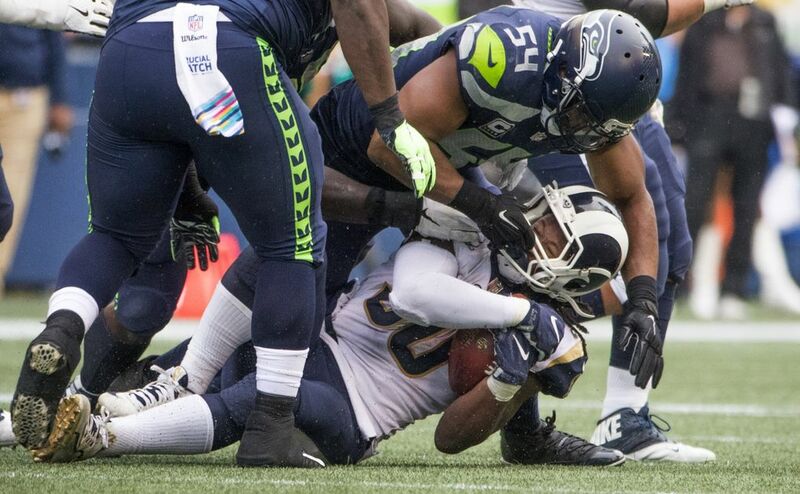 It felt on about three occasions that the Rams were about to take control of this game. 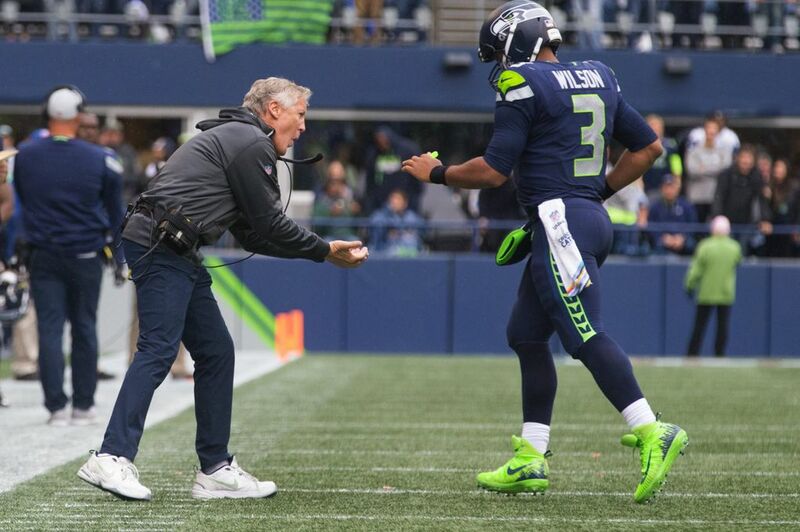 But Seattle has used grit and perseverance and all of those words to keep this tied at 17. That could be viewed as a good thing — hey they are tied! 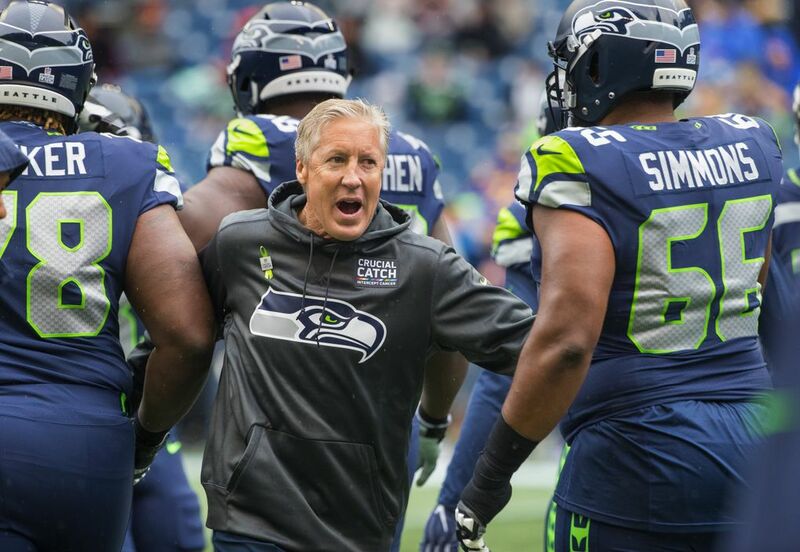 Or that once things start to even out the Seahawks are going to be in trouble. We’ll see. 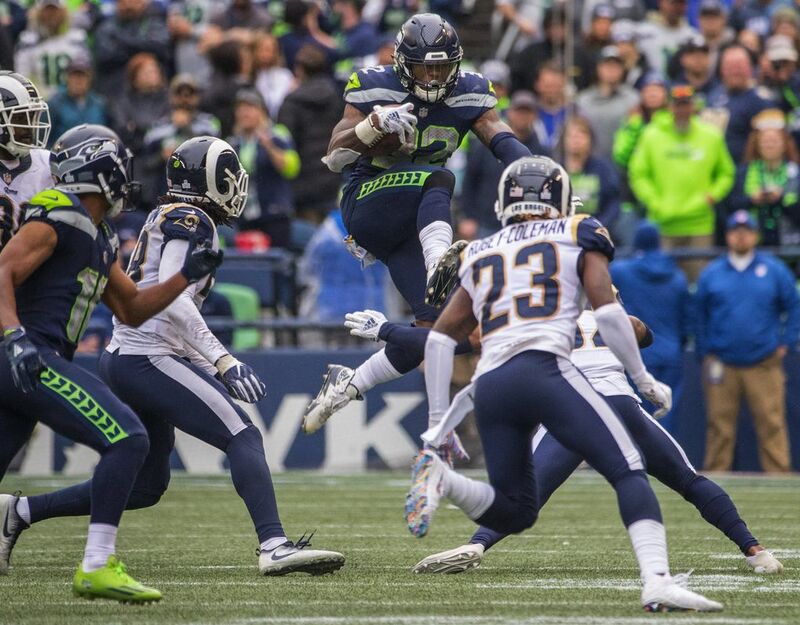 What a weird special teams game with each team having issues with kickoffs and a blocked punt and also a Seattle return that set up a TD and Janikowski’s field goal, which couldn’t have been bigger – think if the Rams had taken the ball at the 42 at that point with a lead. 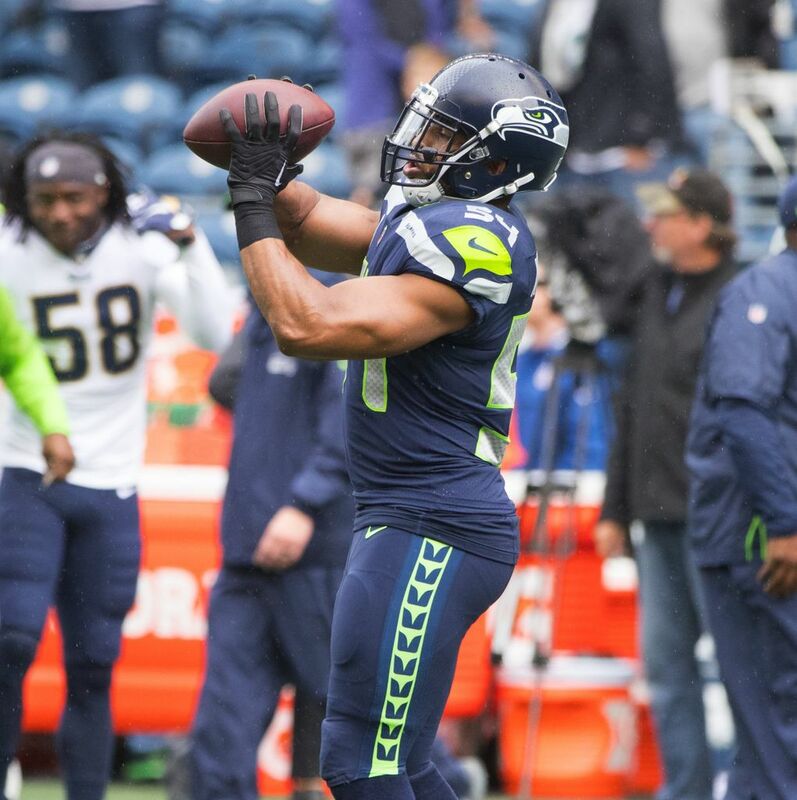 Doug Baldwin with just one target and one reception for one yard is a little weird to see. 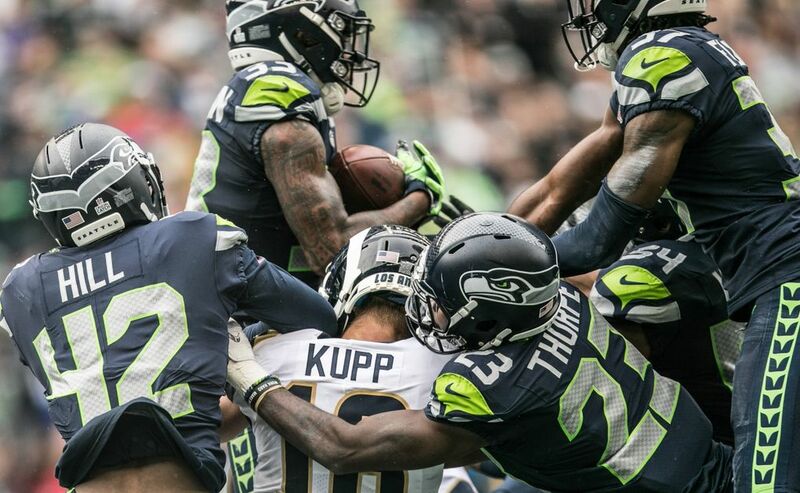 6:02 | Rams 17, Seahawks 14 Eastern Washington product Cooper Kupp is having himself a game back in the state of Washington. His fifth catch of the first half goes for six yards and a score — and another lead change.
.@jaredgoff16 to @CooperKupp for the @ramsnfl TD! 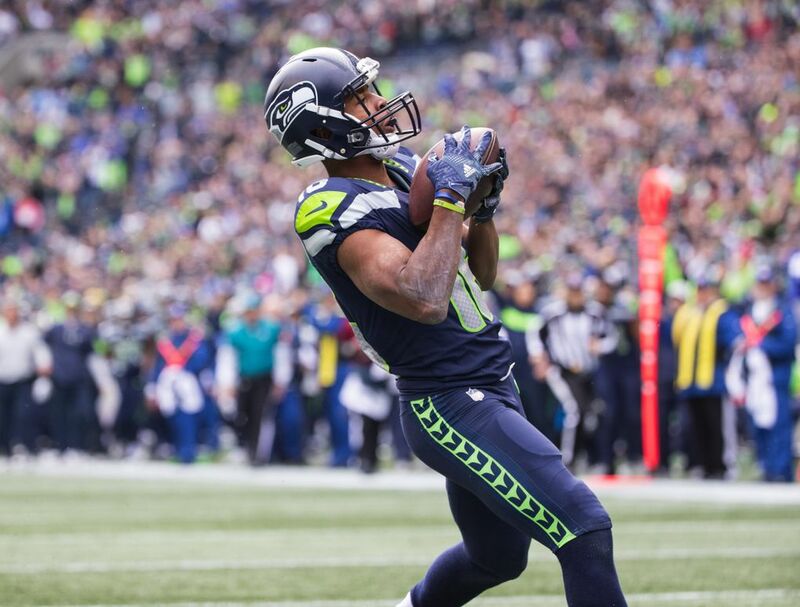 Lockett has four touchdowns in fewer than five games this season, and the shortest score still went for 20 yards against Chicago. His other TDs are 51 yards against Denver, 52 yards against Dallas and 39 yards in the second quarter against the Rams on Sunday. He also set up Sunday’s score with a 42-yard kickoff return as well. 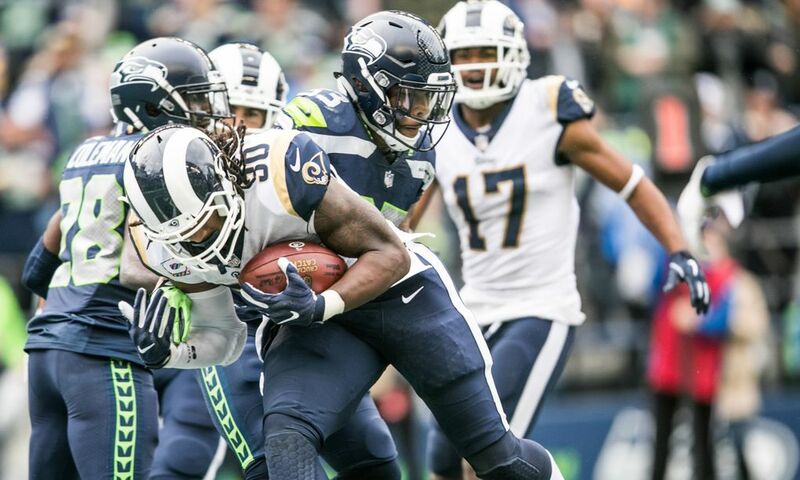 12:16 | Rams 10, Seahawks 7 Todd Gurley takes an end-around nine yards to the goal line, initially ruled a TD but instead down at the 1 upon review. A goal-line stand follows and Los Angeles is limited to three points (and its first lead of the game). 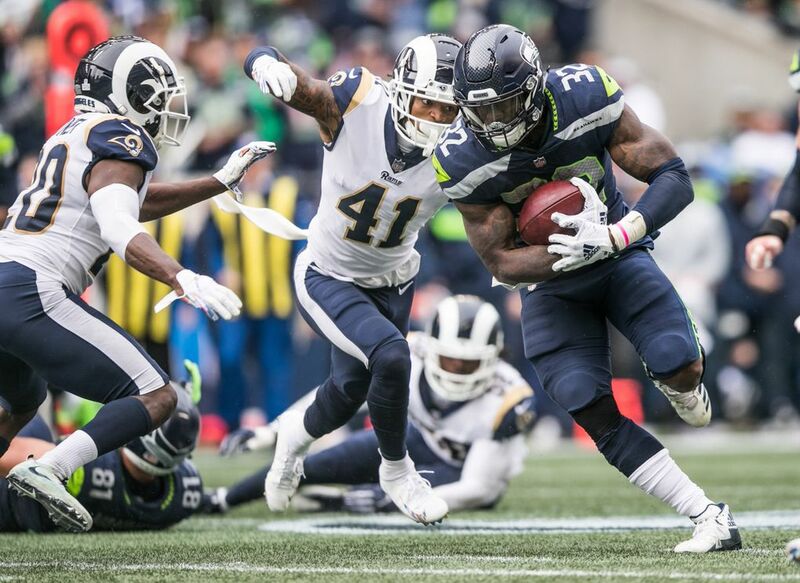 2:00 | Seahawks 7, Rams 7 A quick answer from the Rams: A 27-yard completion to Cooper Kupp and another 16 from a Todd Gurley run set up a two-yard score from Gurley to even it at seven.
.@MikeDavisRB finds the end zone for the @seahawks! 12:39 p.m. Just in case there was a question of why oft-injured tailback C.J. 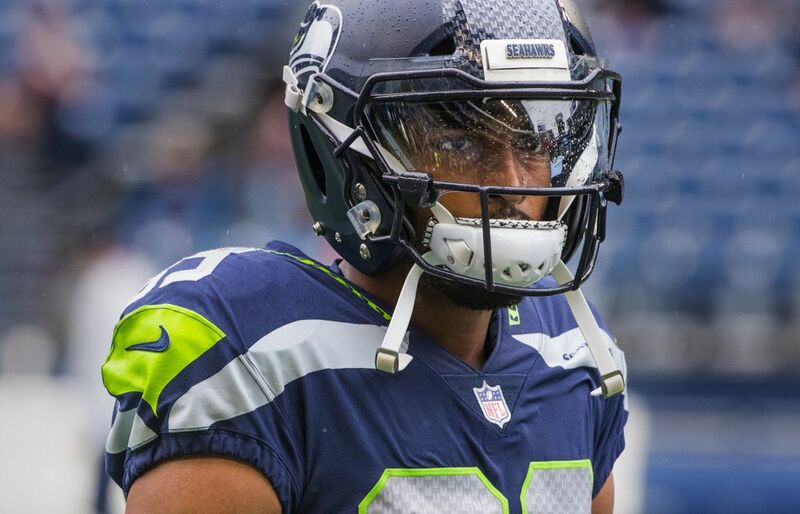 Prosise is inactive today, Seahawks general manager John Schneider said it was not a question of health. 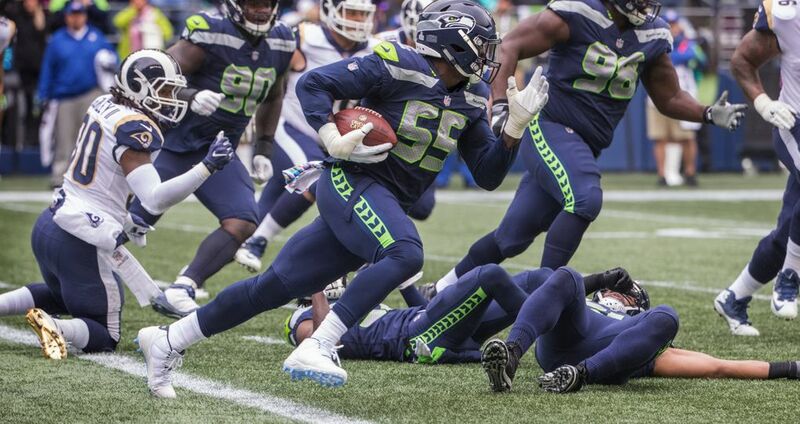 Instead, Schneider said Prosise was deemed inactive solely because the Seahawks had to get down to the gameday max of 46 from the 53 who make up the roster during the week. 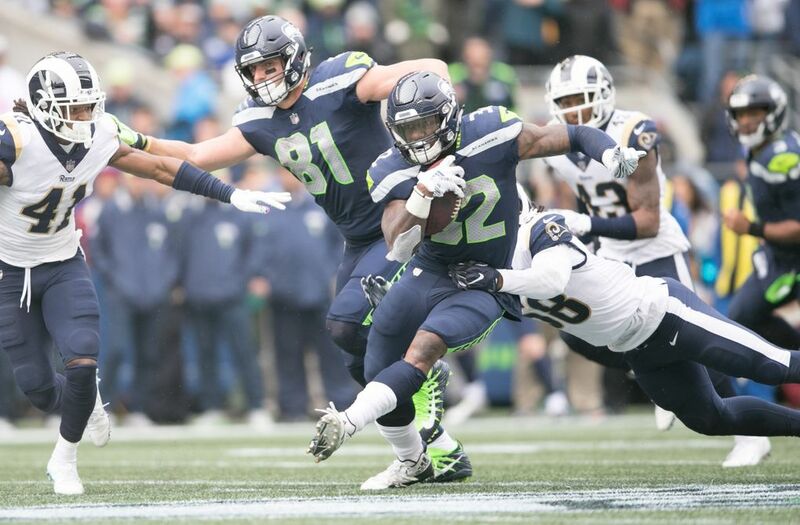 Seattle has gone with three tailbacks on the active roster for three of the first four games and is doing so again today, with Chris Carson, Mike Davis and Rashaad Penny the active tailbacks. “C.J. had a really good week of practice and he’s inactive today,’’ Schneider said during his regular weekly pregame radio show on the team’s flagship radio network. 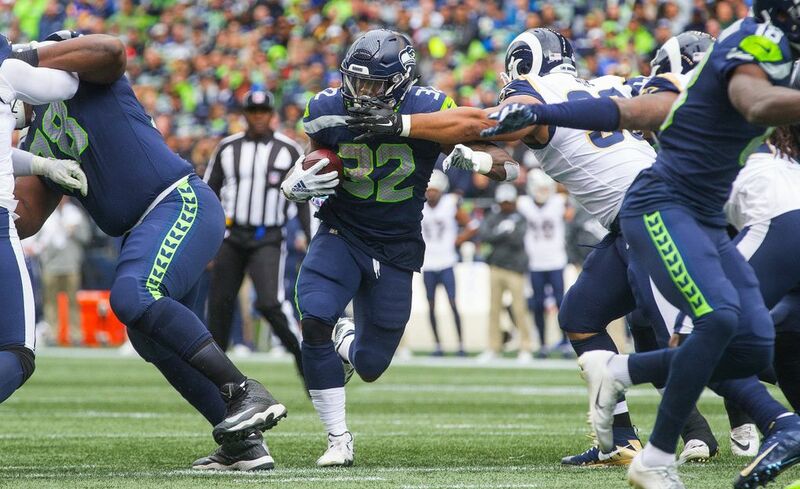 Prosise was not on the injury report all week and was active for last week’s game against Arizona. 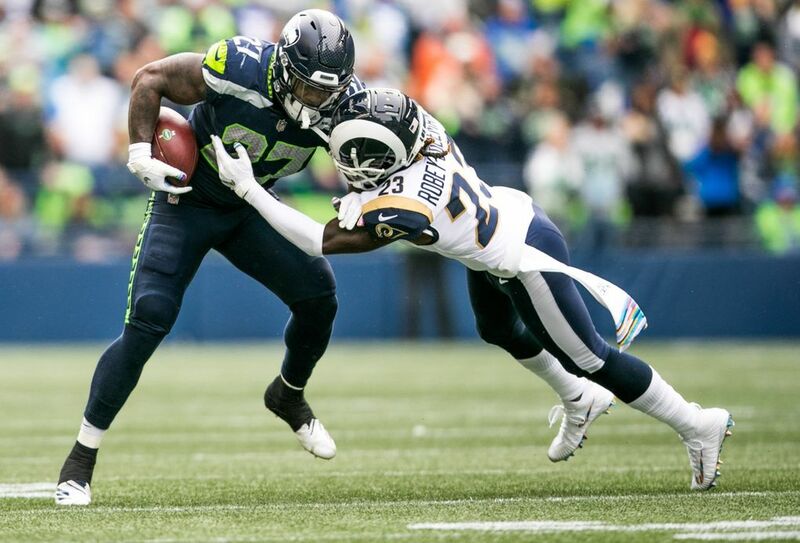 Davis was a healthy scratch in week one, Prosise was inactive week three due to a groin issue and Carson was inactive in week four due to a hip injury with Seattle going with four tailbacks in week two against the Bears. 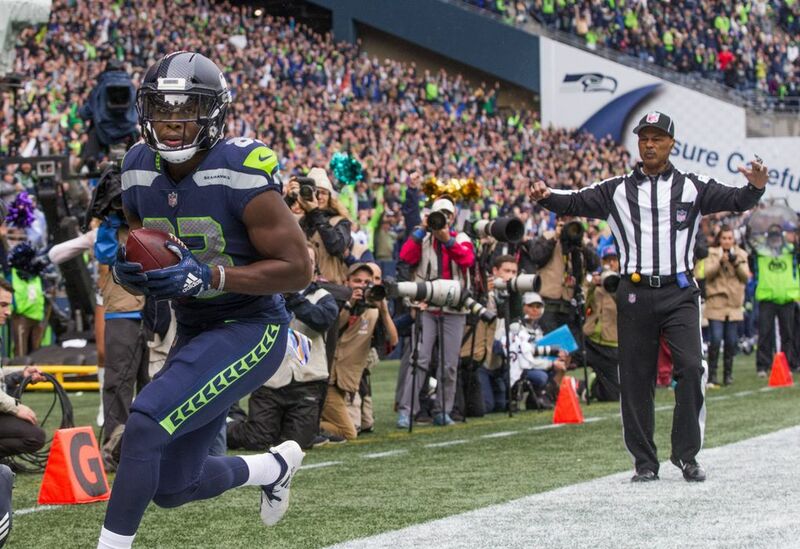 Seattle will have an even greater numbers crunch at tailback when J.D. McKissic can come off of Injured Reserve after the eighth game of the season, as is expected. And at that point the team could have a decision to make if it wants to keep five tailbacks on its 53-man roster. 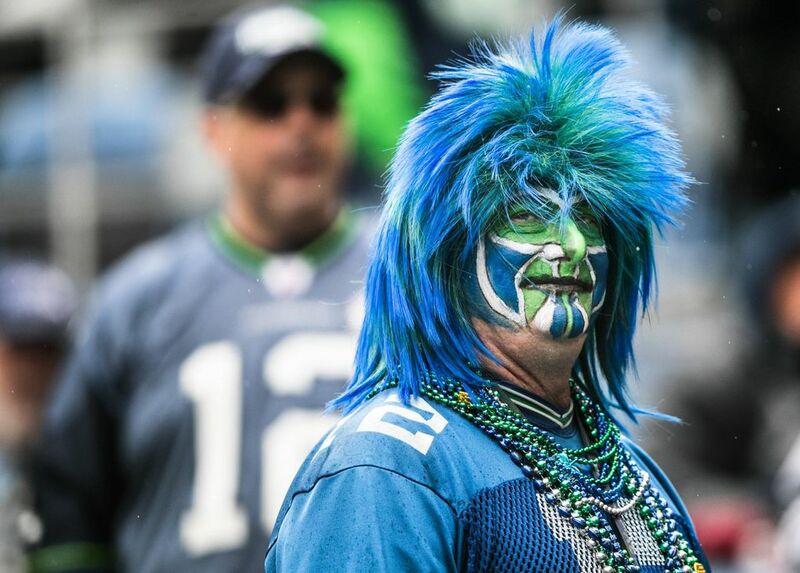 But for now Seattle seems content with having four and going with three on gameday. 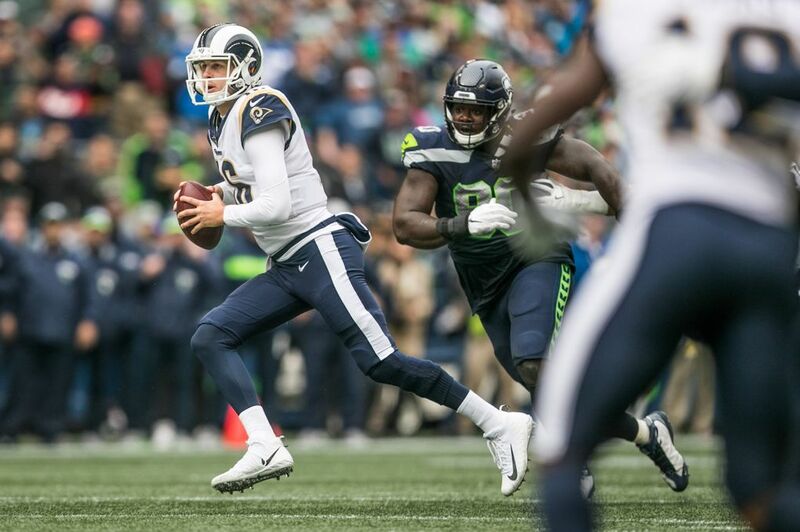 12:08 p.m. Frank Clark, who was listed as questionable, heading into Sunday’s game against the Rams, is one of Seattle’s active players and will play. Clark is tied for the team lead in sacks with three but did not practice on Wednesday, Thursday or Friday after suffering food poisoning. However, one player listed as questionable — offensive lineman Ethan Pocic — will not. 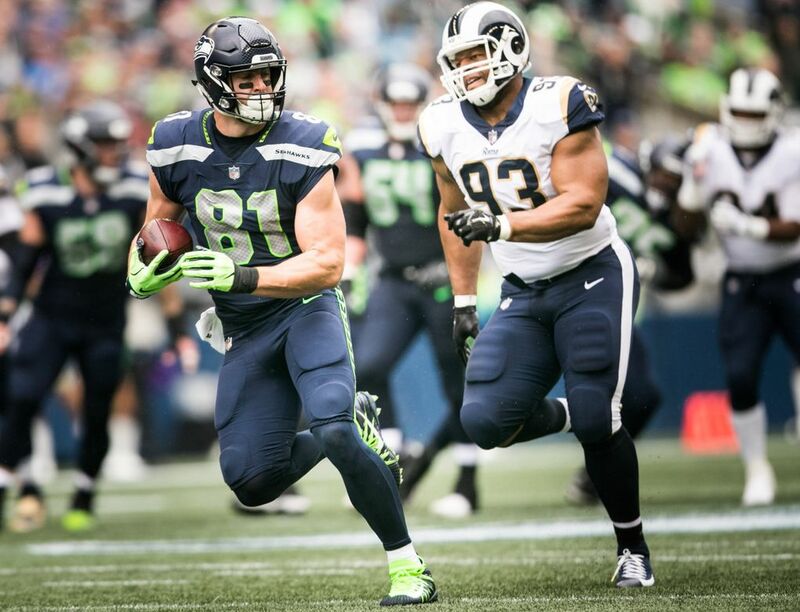 Pocic is one of the seven inactive players, leaving George Fant, Jordan Simmons and Joey Hunt as active backup offensive linemen. 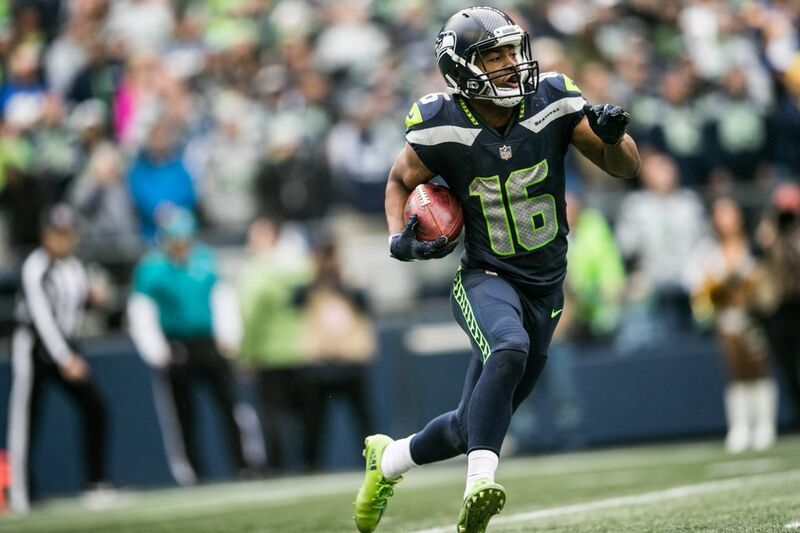 Other inactive players are receiver Keenan Reynolds, running back C.J. 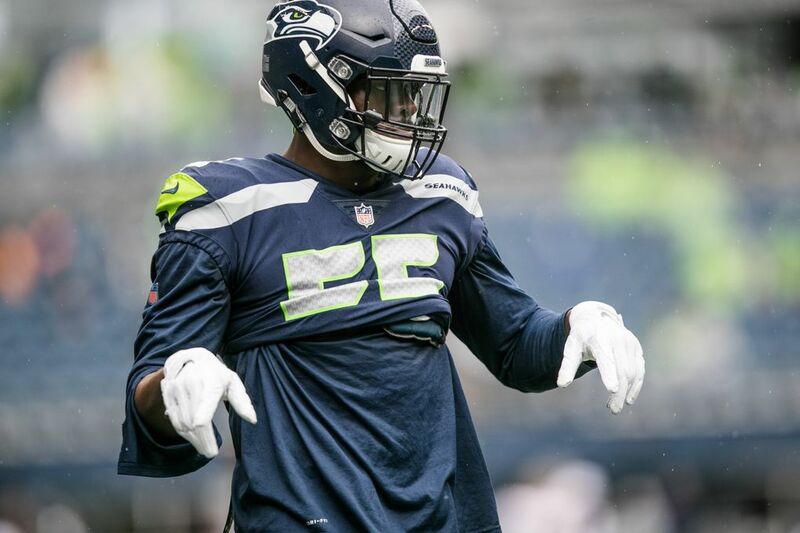 Prosise, linebacker K.J. Wright, defensive end Rasheem Green and safety T.J. Green. 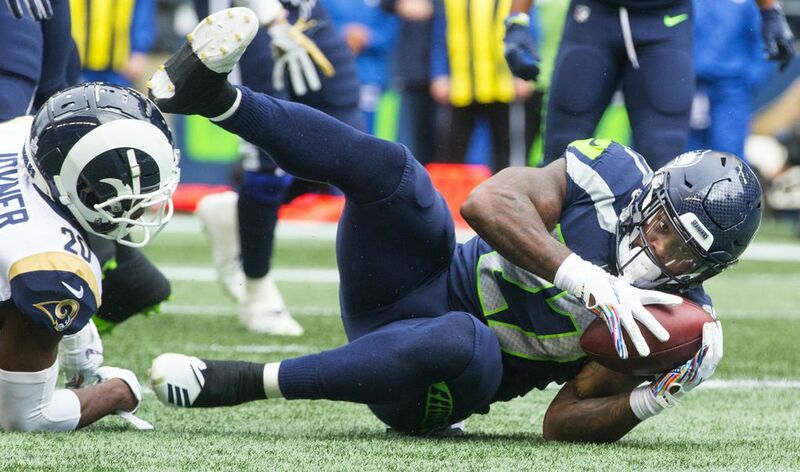 Rasheem Green is out with an ankle injury and Wright is out with a knee injury. This is the fifth regular season game Wright has missed after suffering an injury in the third preseason game against the Vikings.